Growing up in Oregon meant that summertime was blackberry time. And if you have spent any amount of time in the Northwest during the summer than you know what I mean about the blackberries that seem to grow everywhere. If you travel the countryside you are sure to find blackberries growing. They love the cool rainy weather and grow like weeds in many places. Growing up we could almost always walk into the field or down the road and find an abundant amount of blackberries for jams, pies, cobblers, and for freezing to use throughout the year. To this day blackberries are one of my favorite berries. Blackberry pie, blackberry cobbler, blackberry jam, I love them all. 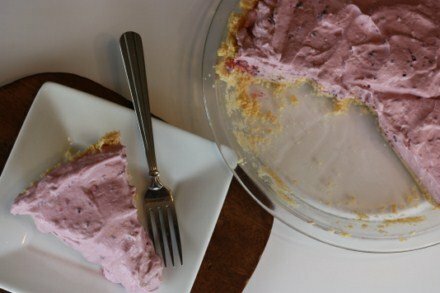 And today I have an easy blackberry pie for you. 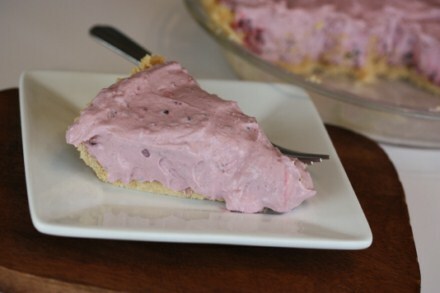 This recipe is very quick and easy to make and is a cool and creamy pie that is perfect for summertime. In a bowl combine jam, cream cheese, and powdered sugar and beat until well combined. Fold in blackberries and then the Cool Whip. 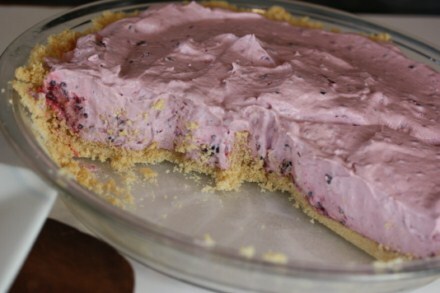 Spread into graham cracker crust and refrigerate for several hours or until ready to serve. Thanks! I really think this would work with any berries and jam. I hope you enjoy it!